Global companies have been leveraging celebrity appeal for years. In this star-conscious world and culture, celebrity endorsements escalate the unique selling position of a brand’s product or service. Steve Wyrick has universal appeal and, through his magic, transcends all demographics. With a career paralleled by only a few in his industry, Wyrick has endorsed and co-branded with some of the most iconic companies in the world, including Ford Motor Company, Orange Country Choppers, and the infamous restaurant chain Hooters. By creating original illusions based on each brand’s individual market dynamics, he has been able to set the stage for major integrated marketing campaigns to drive sales. Ford Motor Company approached Steve Wyrick to design and create an epic stunt that would launch the 2010 Ford Mustang in a series of webisodes entitled “The 10 Unleashed.” Ten celebrities, including Steve Wyrick and Queen Latifah, were given an opportunity to unleash their inner Mustangs. Steve partnered with world-famous drifter Vaughn Gittin, Jr. and created a stunt that shut down the Las Vegas Strip in both directions for a mile. Thousands of Las Vegas tourists watched from behind sidewalk barricades as Steve was chained into a framework by the Las Vegas Metropolitan Police Department, with barely enough room for a Mustang to drive through. Vaughn Gittin, Jr. drifted through Steve and the structure at over 100 mph. What followed shocked the entire crowd. The driver-side door of the Mustang opened and Steve was driving the car. This was one of the most dangerous challenges ever staged in the history of Las Vegas. 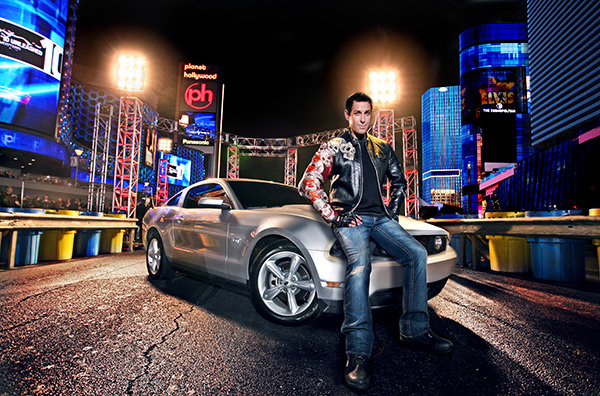 The stunt was broadcast on SpikeTV.com and Ford.com and was featured on “The 10 Unleashed” series of webisodes as a marketing tool for Ford dealerships across the country. In addition, a co-branded line of merchandise was developed. 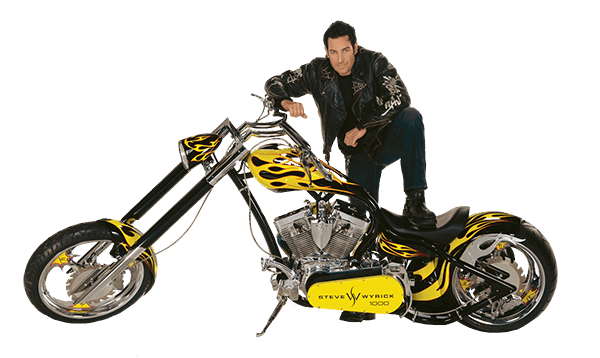 Paul Teutul, Sr. of Orange Country Choppers and Steve partnered together to co-brand and design the SW1000 Custom Chopper, named by the Teutels to commemorate the performance of Steve’s 1,000th show at Planet Hollywood Resort and Casino in Las Vegas. 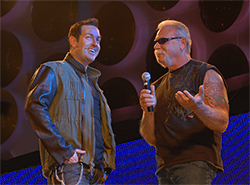 The designing, building, and revealing of the bike was filmed for the reality television show American Chopper on the TLC network. In addition, some radical illusions that Steve had demonstrated for the Teutuls using equipment from their shop at OCC Headquarters in Newburgh, NY, were also shown on that one-hour episode. In designing the bike, Steve challenged the Teutels to make one part of it invisible. Together, they created a secret gas tank to be hidden in the rear wheel well so that the bike would appear to have a gas tank that was invisible. Again, Steve decided to push the limits and when the Teutuls brought the SW1000 to Las Vegas for the reveal, it was placed inside a large clear glass box on the Las Vegas Strip. Five thousand people showed up to see the chopper and when Steve pulled off the cover, the box was empty. The Teutuls were shocked and the entire audience was puzzled as well. Steve told Paul Sr., “I asked you to make one part of my chopper invisible, not the entire bike!” Steve asked the Teutuls to stand back as a wall of fire ignited around the box and smoke started to fill it. The sides of the box lowered to reveal the custom chopper. The crowd went crazy and Steve saw the finished bike for the first time. Steve Wyrick and OCC subsequently co-branded and licensed together a clothing line for men and women featuring the SW1000. Hooters of America, the iconic restaurant chain, contacted Steve to be the first celebrity entertainer to ever appear on the televised Hooters Annual International Swimsuit Pageant live from The Joint inside the Hard Rock Hotel & Casino in Las Vegas. The special aired on Fox Sports 1 television network. Steve consulted with the head of Brand Development for Hooters of America and created an original multimedia illusion in which he took “sawing a woman in half” to new technological levels. For the first time in history, the separated body parts (head and torso and legs and feet) could be examined up close by an audience member. Audrina Patridge, star of MTV’s The Hills and NBC’s First Look, checked them out and could not believe what she was seeing, exclaiming “It’s live real!” For the ultimate finale to the illusion, Steve reassembled the girl and virtually morphed her clothing into the iconic Hooters uniform. Partnering with Steve Wyrick for a corporate branding initiative or celebrity endorsement ensures that Steve and his team will identify your brand’s most compelling, unique attributes and visually illustrate your story powerfully and directly through magic. To contact the Wyrick Brand Integration and Endorsement Department, click here.